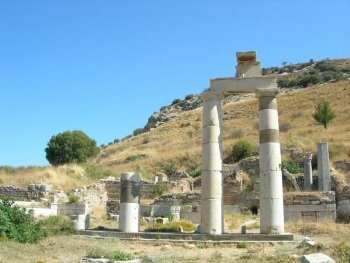 Ephesus contains successive settlements from the Neolithic, Hellenistic, Roman, Byzantine, Selçuk and Ottoman periods. The property is located at the Aegean Coast of Turkey. Ephesus was one of the great cities of antiquity, and erstwhile home to the Temple of Artemis, one of the Seven Wonders of the Ancient World. After its harbor silted up, Ephesus lost value as a commercial center and never recovered. However, it left behind impressive ruins, which unfortunately don't include the Temple of Artemis. Ephesus is also important for Christian travelers, both for its Biblical history and as a pilgrimage site to the believed last home of Mary, the mother of Jesus. With such history I was surprised it took until 2015 for the city to become a World Heritage Site. I visited Ephesus in the spring of 2013, and thoroughly enjoyed wandering the ruins of the city. The restored façade of the Library of Celsus was magnificent, as was the large theater at the end of the former Harbor Street. Also on view were ancient baths, the agora, and a smaller Odeon theater. Although I didn't visit them, there was an archeological excavation of Terrace Houses on display for an additional fee. Ephesus was crowded with tour groups, but I didn't notice them because the city was so fascinating to explore. Logistics: Ephesus is located near Selçuk, and can be reached by walking, biking, minibuses, or private transportation or tours. Ephesus is a popular stop for cruise ships, which often bring large tour groups. Beautiful site with a lot of history. Also the site of one of the seven wonders of the world; the Temple of Artemis (eventhough not much remains of this site). Worth a visit and worthy to be a World Heritage Site. This is a wonderful place to visit and experience history. I hope that it will be made permanent site. It needs to be preserved. Bouleuterion: The "Odeon" doubled as the "Bouleuterion"
Ibn Battuta: "We went on to the city of Aya Suluq [Selçuk/Ephesus], a large and ancient city venerated by the Greeks, in which there is a great church [Church of Mary] built with huge stones, each measuring ten or less cubits in length and skilfully hewn." 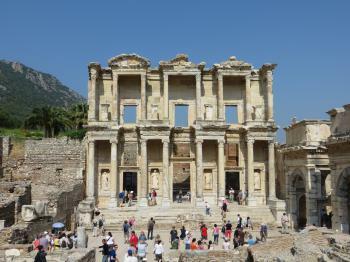 St Paul was here: St Paul visited Ephesus on both his 2nd and 3rd mission - staying over 2 years on the latter occasion. His preaching stimulated the "Silversmith's Riot". See link. And Nomination File "In a quickly arranged assembly in the large theater of Ephesus the disputes became tumultuous. Supposedly the people chanted “Great is the Artemis of Ephesus” for two hours until the municipal scribe was able to calm the situation"
206 Community Members have visited.